Published on October 18, 2008 in figma and Reviews. 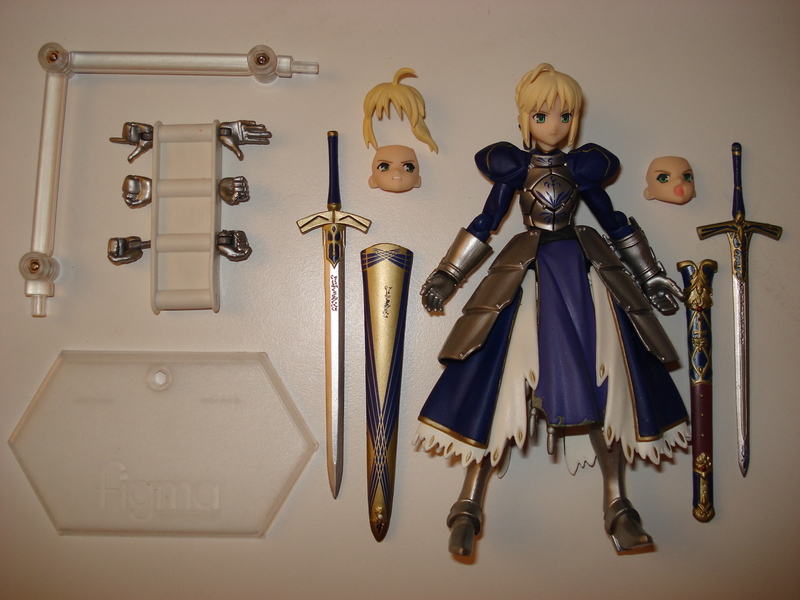 3 Comments Tags: fate stay/night, figma, figma:saber. 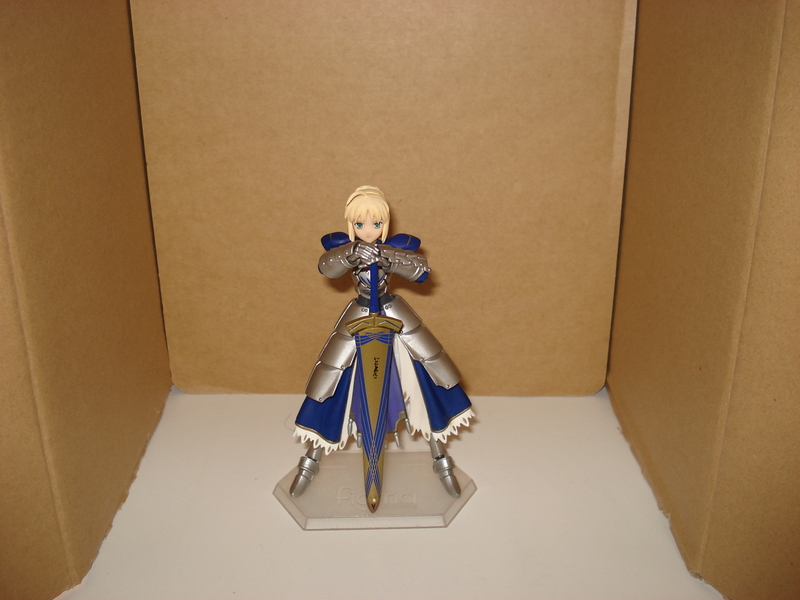 Today we’ll be looking at Max Factory and Good Smile Company’s 3rd figma, Saber from Fate Stay/Night. 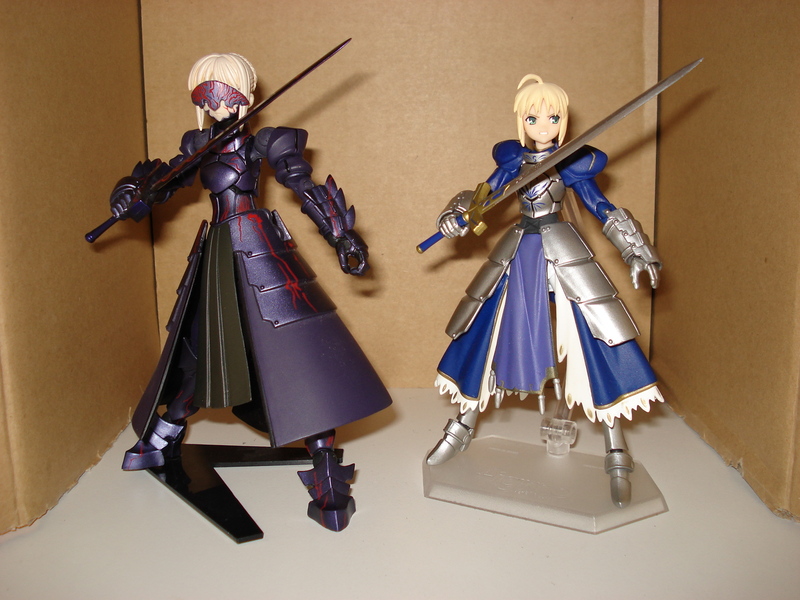 As a bonus, we’ll be comparing her to Kaiyodo’s Revoltech Saber and Saber Alter. 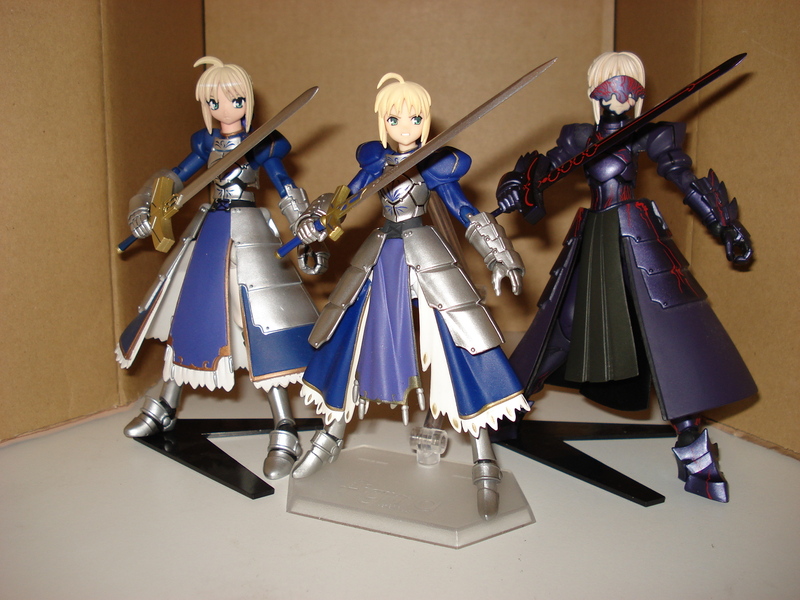 Saber’s a little different from the previous figmas, and comes with a fairly large number of accessories compared to her predecessors. The only regular accessories she comes with is the 3 jointed stand and base, as well as the figma bag. She only comes with 3 pairs of extra hands, with only the fists and sword hands being paired. The other pair consists of a left hand pointing and an palm with outstretched fingers. I don’t know why MF/GSC decided to only include one side per type of hand with this pair, but it might just be my luck of the draw if others got the full set. You’ll want to note that her hands are not symmetrical. Her left hand has extra armor over the fingers, effectively combining them. This makes them easier to distinguish between left and right. 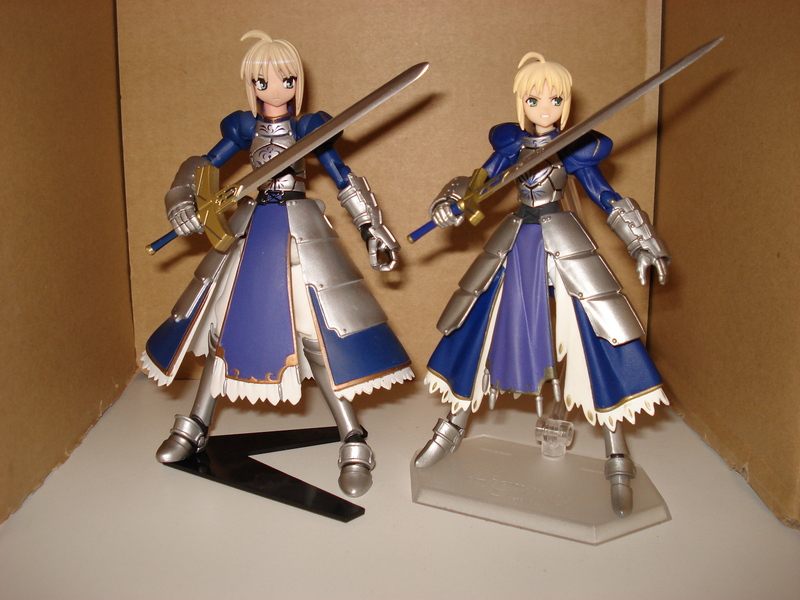 Saber comes with 2 extra faces; one with gritted teeth looking left, and one with her mouth open looking right. She also comes with an extra set of bangs, this one blowing her hair over to the left. Weaponry includes both Caliburn and Excalibur, as well as Caliburn’s sheathe and Avalon. Caliburn and Excalibur are both ‘engraved’ on one side of the blade with runes, showing the attention to detail in the figma line. Her battle skirt is connected to her body via some figma joints, and can open up like a clam if you need to position her legs for posing. Pros: As I stated before, she comes with a lot of stuff. 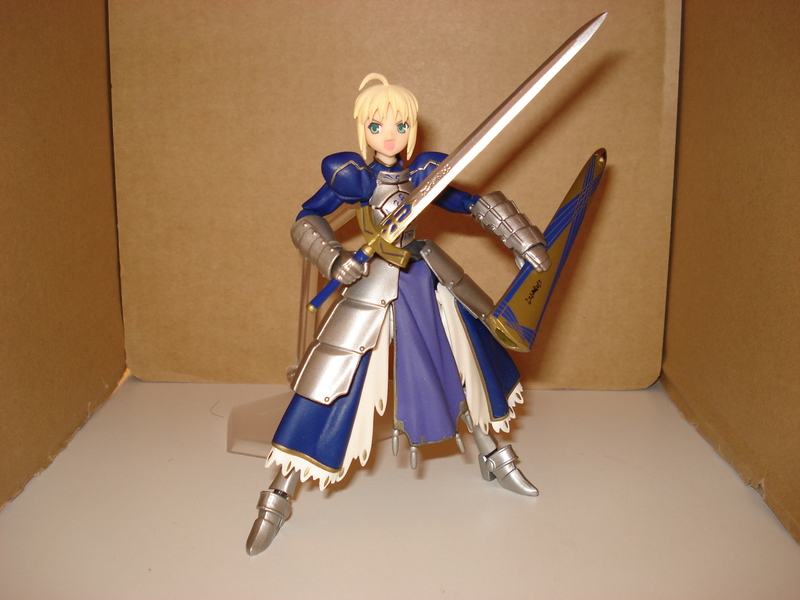 The left hand that comes connected to her has a small indentation so you can pose her in the classic Saber pose where she’s standing with her sword in front of her holding the hilt. I have an example in the gallery at the end of the post. The swords can be sheathed in their respective sheathes as well. 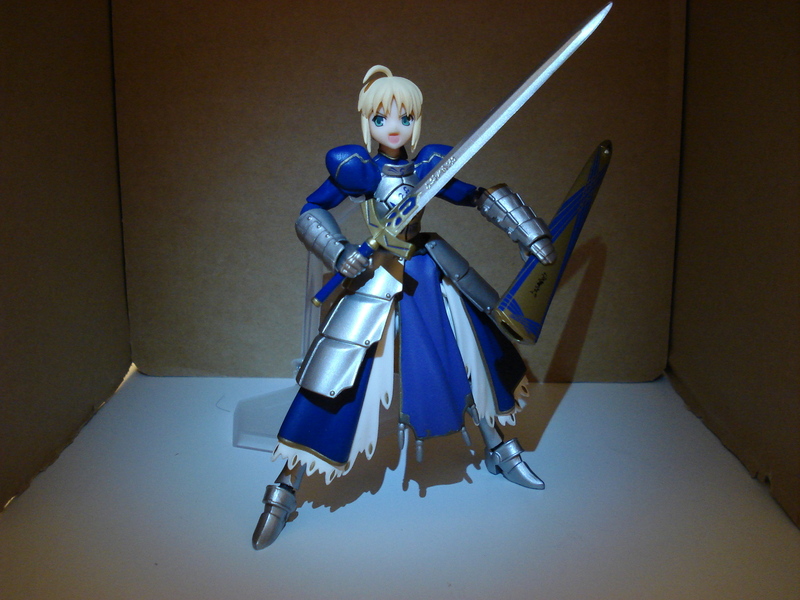 The extra faces give a lot of personality to the figure, allowing Saber to express herself in many ways. Cons: First off the hands. As I said above, it may just me my luck that only gave me 3 sets instead of the usual 4, but that’s neither here nor there. For some reason, the right shoulder joint keeps popping of whenever I do an posing with it. Lastly, her left handed sword hand’s wrist joint broke off on me the other day, so I had to super-glue it back on. I hardly ever make use of the joints when she’s holding anything, so it should be fine. Also, her breastplate is a bit loose, and doesn’t stay in place unless you have the stand plugged into the back. It’s not a huge thing, but is annoying. 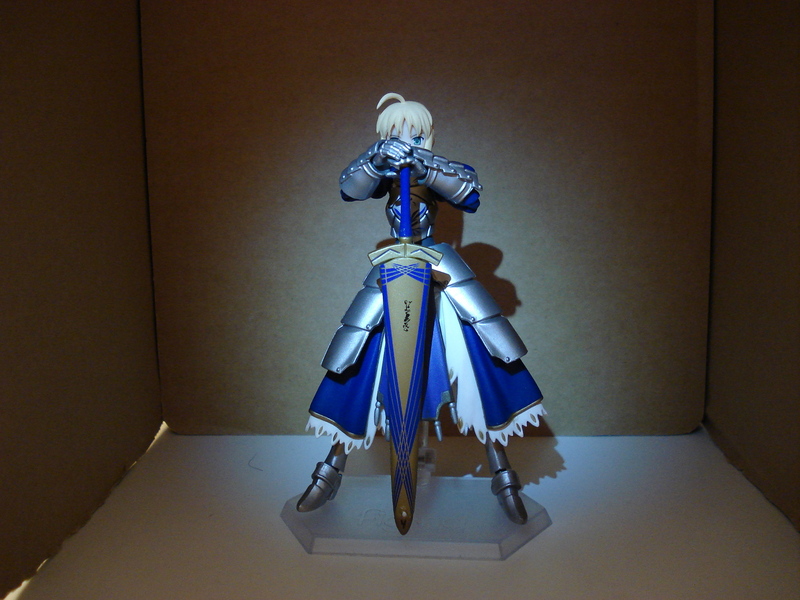 Saber figma is a great addition to the line, and of course, the accessories can be used on other figma as well. I’ve seen her online costing between $30-35, probably because of all the accessories she comes with, and is definitely worth adding to any figma collection. 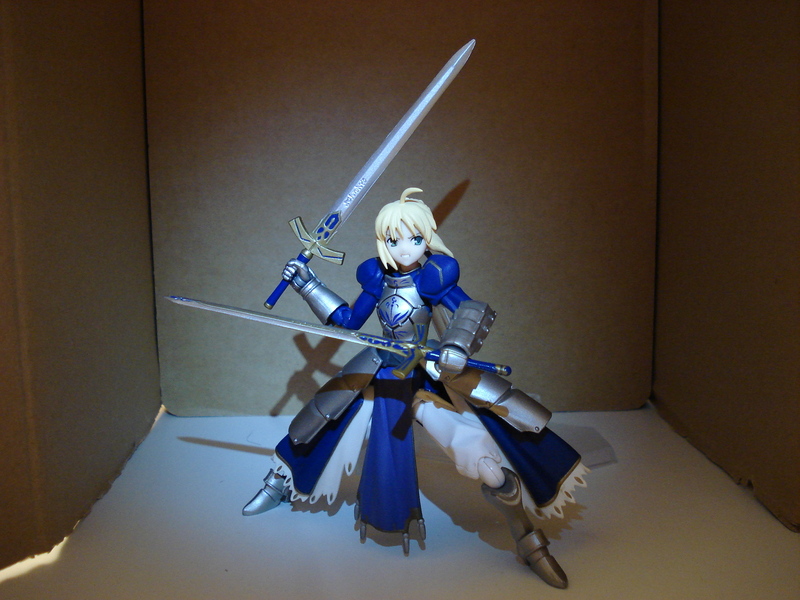 As I stated, I am including a comparison review of Saber’s Revoltech counterparts. Pros: Size. Revoltech are somewhat larger compared to their figma counterparts. The joints ratchet, keeping the pose consistent. Cons: Even though they have Revoltech joints, not all the joints are such. The elbow joint is just a nut and bolt, and loosens easily. Revoltechs don’t come with many accessories, so you have to make do with what you get. The stand serves mainly to stabilize the figure, since it can’t always stand on its own. Most of this is because of the Revoltech joints, because you can’t fine tune the angle of the feet because of the ratchet. Basically, I loved the Revoltechs when they came out, but once figma hit the scene, my Revoltechs became old news. Kaiyodo still makes great figures for the robot line of Revoltechs, and I will continue to purchase them for robots like Enki and humanshapes not in the figma line like Yoko and Anti-Spiral Nia. To me, figma is just a superior posable figure. Lastly, I’d like to apologize if some of the images below seem lighted unusually. I usually snap my blog pics at work since I have a good light source there, but since I’m not at work today, I had to make do with what I had and was playing around with lighting options. No I think you really only get 3 pairs of spare hands. I had that issue and I panicked. It happened with Lelouch too, so I think it’s normal.